Two years ago at Christmas I was living in Montana in the Rocky Mountains where I grew up. 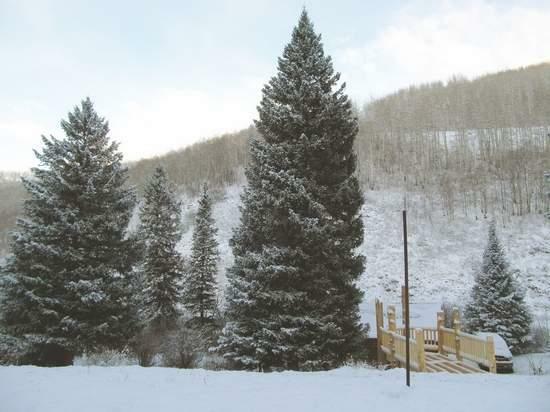 The National Forest Service there allows people to cut their own Christmas tree. So Jan, my wife, and I went out one day with an axe into the snow-filled forest to get ours. We spotted what looked like the right tree-it was 200 yards up a hillside, and we had to tramp through snow to get to it. In that forest and on that hillside it was a spectacularly beautiful tree. But after we got it back to our home on the lake and set it up in our wood-fired and carpeted living room, we realized that a considerable amount of its charm had been lost in transit. It was an Engleman spruce, a tree with character, having lived a hard life on the mountain, and we had hiked through 16 inches of snow to get it. It still looked handsome enough to me, but when our three children, all adults now, arrived to celebrate the holiday with us, they took one look and mocked. They were used to coifed Scotch pines, bought from the Lions Club in the Safeway parking lot in Maryland. If those were too picked over, we patronized the Boy Scouts selling from the Methodist parking lot. Buying a tree was a family affair, with arguments about size and thickness and symmetry. This was our first tree chosen without benefit of children. In Montana, with an entire forest of trees to pick from, they thought we could have done better. We reminisced about the Christmas trees we had bought and set up and decorated. The more we talked, the more scrawny this Engleman spruce appeared. But finally we all agreed it was a tree, after all, and the moment it was designated Christmas tree it was suitable. People worry these days about keeping Christ in Christmas; no one has any anxiety about keeping the tree in Christmas. Nobody I know discusses the pros and cons of the matter; it is simply done. There must be numerous households in America where no prayers are offered at Christmas, no carols sung, and no nativity story told. But there can be few households where there is no Christmas tree. The tree is required. We always had a tree, and always will. It is as much a part of Christmas as the crèche and "Silent Night." because the nations are dismayed at them, for the customs of the peoples are false. There was no doubt in her mind that the Holy Spirit, through the prophet Jeremiah, had targeted our American Christmas in his warning satire. Every detail fit our practice. A couple of weeks before Christmas, on a Sunday afternoon, my father would get the axe and check its edge. He was a butcher, used to working with sharp tools, and he did not tolerate dull edges. When I heard the whetstone applied to the axe, I knew that the time was near. We bundled into our Model A Ford pickup, my parents and baby sister and I. If it was not too cold, I rode in the open truck bed with our springer spaniel, Brownie, and held the axe. It was a bouncy ride of ten miles to Lake Blaine, where the Swan Range of the Rocky Mountains took its precipitous rise from the valley floor. There had been a major forest fire in this region a few years before, so the trees were young-the right size to fit into our living room. I always got to pick the tree; it was a ritual I stretched out as long as parental patience and winter temperatures would accommodate. My father then took over, swinging the axe. Four or five brisk cuts, and the green-needled spire was horizontal in the snow: A tree from the forest is cut down. He then squared the base of the trunk so it would be easy to mount when we got it back home: Worked with an axe by the hands of a craftsman. My father was deft with the axe-the wood chips from the whittling released the fragrance of resin in the winter air. When we arrived home, I climbed into the attic and handed down the box of decorations. We had multicolored lights on our tree, and lots of tinsel. Across the street, my best friends had all blue lights, and I felt sorry for them, stuck with a monochrome Christmas. My father took slats from packing boxes that our sausage and lunch meats were shipped in-there was always a pile of these boxes in the alley behind our butcher shop-and cut them into four 18-inch supports and nailed them to the tree trunk: They fasten it with hammer and nails so that it cannot move. By now it was late afternoon and dark. Our Douglas fir—it was always a Douglas fir for us, no other evergreen was a Christmas tree—was secure and steady before our living room window, facing the street. We strung the lights, hung the silver and gold ornaments, and draped the tinsel: Men deck it with silver and gold. When we were done, I ran out onto the gravel road (the paving on Fourth Street West fell short by about 400 yards of reaching our house) and looked at it from the outside, the way passers-by would see it, the framed picture of our Christmas ritual adventure into and out of the woods. I imagined strangers looking at it and wishing they could be inside with us, part of the axe/ Model A pickup/Lake Blaine/tree-choosing/tree-cutting/tree-mounting/tree-decorating liturgy that I loved so much. And I would look across the street at the tree with blue lights where the Mitchell twins, Alva and Alan, lived—so cold and monotonous. They never went to church, and at times like this it showed. I couldn't help feeling privileged and superior, but also a little sorry for them: Christian pride modified by Christian compassion. And then, in the winter of 1940, when I was eight years old, we didn't have a tree: For the customs of the peoples are false. It wasn't just the tree that was absent, the richly nuanced ritual was abolished. A noun, "tree," was deleted from December, but along with it an adjective, "Christmas." Or so I felt. And it was all because Jeremiah had preached his Christmas Tree Sermon. Because Jeremiah had looked through his prophetic telescope, his spirit-magnified vision reaching across 12,000 miles and 2,600 years saw in detailed focus what we did every December, and denounced it as idolatry. And it was because my mother cared far more about Scripture than culture. I was embarrassed—humiliated was more like it—humiliated as only eight-year-olds can be humiliated. Abased. Mortified. I was terrified of what my friends in the neighborhood would think: They would think we were too poor to have a tree. They would think I was being punished for some unspeakable sin and so deprived of a tree. They would think we didn't care about each other and didn't have any fun in our house. They would feel sorry for us. They would feel superior to us. As a regular feature of the child-world holiday socializing in our neighborhood, we went to each other's houses, looked at the presents under the trees, wondering what we would get. Every house was so different-I marveled at the odd ways people arranged their furniture. I was uneasy with the vaguely repellent odors in houses where the parents smoked and drank beer. At the Zacharys, three houses down, there was a big pot of moose-meat chili simmering on the back of the wood stove for most of the winter—it was easily the best-smelling house among those of my friends. But that year, I kept everyone out of our house. I was ashamed to have them come in and see the bare, treeless room. I was terrified of the questions they would ask. I made up excuses to keep them out. I lied: "My sister has a contagious disease"; "My mother is really mad and I can't bring anybody in." But the fact of no-Christmas-tree could not be hidden. After all, it was always in our front window. Alva and Alan, the twins who never went to church, asked the most questions, sensing something wrong, an edge of taunting now in their voices. I made excuses: "My dad is too busy right now; we're planning on going out next week." And on and on. I was mostly terrified that they would discover the real reason we didn't have a tree: that God had commanded it (at least we thought so at the time)—a religious reason! But religion was the one thing that made us better than our neighbors; and now, if they were to find out our secret, it would make us worse! My mother read Jeremiah to me and my little sister that year and talked about Jesus. She opened the Bible to the story of the nativity and placed it on the table where the Christmas tree always stood. I never told her how I felt, or what I knew everyone in the neighborhood was saying. I carried my humiliation secretly, as children often do, stoical in the uncomprehending adult world. It is odd when I think back on it now, but we never went to church on Christmas. Every detail of our lives was permeated with an awareness of God. There was a rigorous determination to let Scripture and Christ shape not only our morals and worship, but also the way we used language and wore our clothes. Going to church was the act that pivoted the week. But there was no church-going on Christmas. On Christmas Eve we exchanged and opened presents; on Christmas Day we had a dinner at our house with a lot of relatives in attendance, plus any loose people in the neighborhood-bachelors, widows, runaways. Christmas dinner was full of Norwegian talk. It was the only day in the year I heard Norwegian spoken. My uncles and aunts reminisced over their Norway Christmases, and savored the sounds of their cradle tongue. The Christmas menu was always the same: lutefisk, fish with all the taste and nutrients leached out of it by weeks of baptism in barrels of brine, and lefsa, an unleavened, pliable flat bread with the texture (and taste) of a chamois cloth. There was a stout but unsuccessful attempt to restore flavor by providing great bowls of melted butter, salt cellars, and much sugar. It was a meal I never learned to like. But I loved the festivities-the stories in Norwegian that I couldn't understand, the laughter, the fun, the banter. The primary source of the banter was my favorite uncle. He was the best storyteller and always seemed to have the most fun. He also posed as an atheist (I think it was a pose), which provoked my mother, on alternate days, to prayer and indignation. On the Christmas we had no tree, he surpassed himself in banter. He was the first to remark its absence, and his remark was a roar: "Evelyn [my mother's name], where the hell is the Christmas tree? How the hell are we going to celebrate a Norwegian Christmas without a tree?" (He was also the only person I ever heard use profanity in our home, which set him apart in my child mind on a sort of craggy eminence.) My mother's reply, a nice fusion of prayer and indignation, was a match to his raillery: "Brother, we are not celebrating a Norwegian Christmas this year; we are celebrating a Christian' Christmas." Then she got out Jeremiah and read it to him. He was astonished. He had no idea that anything that tellingly contemporary could come out of an old-fashioned Bible. He was silenced, if only briefly. The next year we had a Christmas tree. The entire ritual was back in place without explanation.. Our gray and rust Model A was replaced by a red Dodge half-ton, but that was the only change. I never learned what authority preempted Jeremiah in the matter of the Christmas tree. Years later my mother occasionally said, "Eugene, do you remember that silliness about the Christmas tree when you were eight years old?" I didn't want to remember, and we didn't discuss it. But now I want to remember. And I want to discuss it. It doesn't seem at all silly now. My mother died four years ago, and so I am not going to find out the details that interest me-the turns and twists of pilgrimage during those years when she was so passionate in pursuit of a holy life. She may have been wise in restoring the tree to our Christmas celebrations, but I am quite sure that it was not silliness that banned it that single year. The feelings I had that Christmas when I was eight years old may have been the most authentically Christmas feelings I have ever had, or will have: the experience of humiliation, of being misunderstood, of being an outsider. Mary was pregnant out of wedlock. Joseph was an apparent cuckold. Jesus was born in poverty. God had commanded a strange word; the people in the story were aware, deeply and awesomely aware, that the event they were living was counter to the culture and issued from the Spirit's power. They certainly experienced considerable embarrassment and inconvenience—did they also clumsily lie to their friends and make excuses at the same time they persisted in faith? All the joy and celebration and gift-receiving in the gospel nativity story took place in a context of incomprehension and absurdity. Great love was given and received and celebrated, a glorious festivity, but the neighborhood was not in on it, and the taunts and banter must have cut cruelly into their spirits. So, Mother, thank you. And don't apologize for the silliness. Thank you for providing me with a taste of the humiliation that comes from pursuing a passionate conviction in Christ. Thank you for introducing into my spirit a seed of discontent with all cultural displays of religion, a seed that has since grown tree-sized. Thank you for being relaxed in grace and reckless enough to risk a mistake. Thank you for being scornful of caution and careless of opinion. Thank you for training me in discernments that in adult years have been a shield against the seduction of culture-religion. Thank you for the courage to give me Jesus without tinsel, embarrassing as it was for me (and also for you?). Thank you for taking away the Christmas tree the winter I was eight years old. And thank you for giving it back the next year. Courtesy of Christianity Today www.christianitytoday.com.